I’m obsessed with the night sky just now. Which is unfortunate as now we’re into BST the night sky is coming at a more unsociable hour. 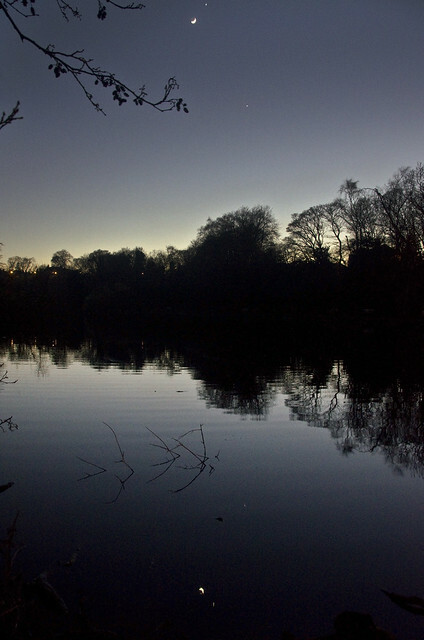 Who’d have thought after a long winter I was going to miss the dark nights? I’ve enjoyed my recent journey into some low level astro-photography, even without a telescope to really start on deep space and planets, with some modest photography equipment it can be an engaging subject to photograph. A crystal clear sky on any night is a joy to behold, especially if you’re away from heavy light pollution, and it’s even more enjoyable once you get an idea what you’re looking at. 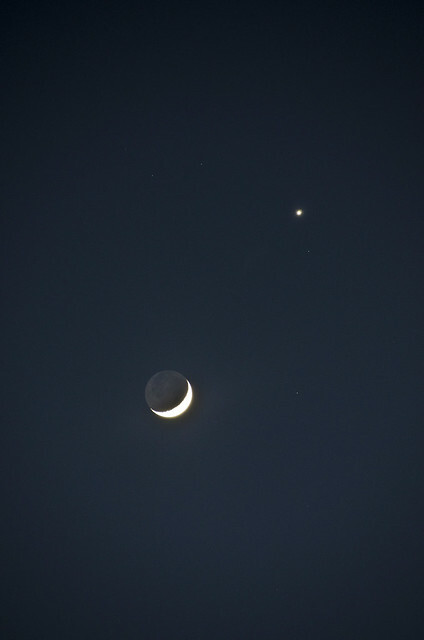 Last night (March 26th) was one of those special nights with a conjunction in the night sky, where 2 or more celestial bodies appear close to each other in the night sky. 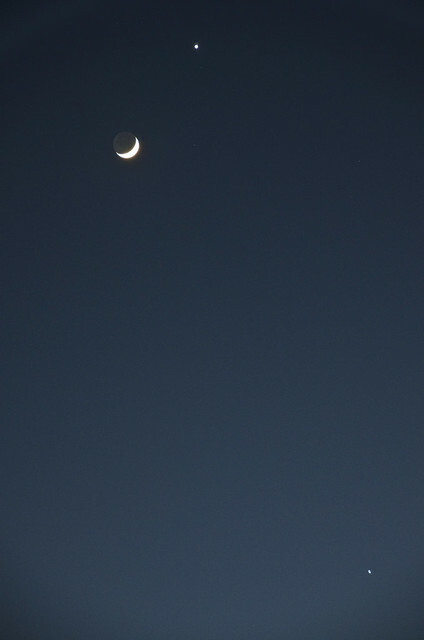 Last night was the turn of a nice thin crescent Moon and Venus to take centre stage. Unlike the night before when Jupiter and the Moon were in conjunction the sky had finally lost that misty haze of the last few days and the seeing was very good indeed. Without a cloud in the sky it was too good an opportunity to miss. We’ve all seen the proper astro-photography stuff, those striking coloured images of distant nebula or close in shots of planets which is specialised stuff but with a basic camera setup you can have a great night working these special night sky events into your pictures. All pictures were taken with a Nikon D7000, on a tripod and fired using a wired remote control, but most cameras would do a decent job with a mid range zoom lens. 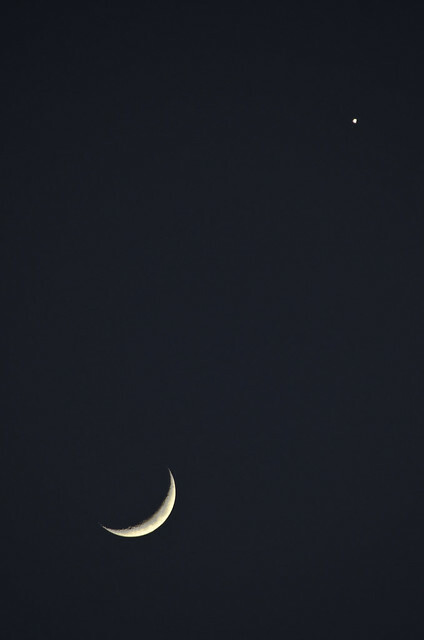 This close in shot of the Moon and Venus show’s just how close they were in the sky. This was taken with a Sigma 70-200mm f2.8 and 2x teleconverter, and it filled the D7000’s frame perfectly. 1/60th, f5.6, ISO400 and 400mm. The moon needs a fast exposure to stop the detail burning out as it’s a very bright object, a full moon requires a even faster shutter, luckily Venus is so bright its fine with the faster shutter speed too. Switching now to a Nikon 18-200mm VRII lens, a general purpose mid-range super zoom, we get a wider view of the same scene. This time though I’ve slightly lengthened the exposure to 1/2s, f5.6, ISO400, -2/3ev and 200mm. 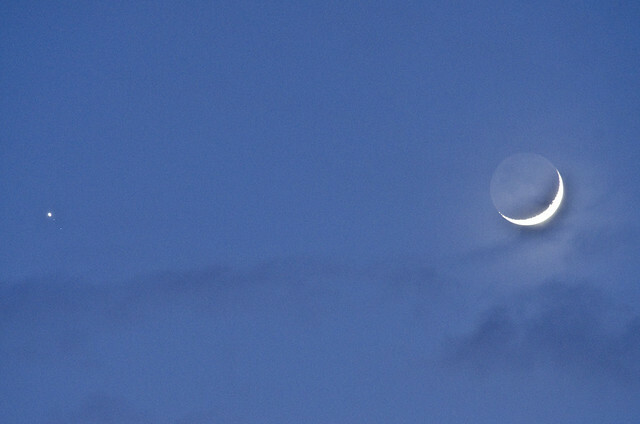 The result is lost detail in the bright part of the moon but I’ve picked up the Earthshine instead, the light reflecting back of Earth lighting the shadow portion of the moon. Pulling back the zoom even further it was possible to include Jupiter in the shot as well. Same settings as the previous shot, but at 135mm. Jupiter is on the lower right of the shot. It’s all very well shooting the moon and planets on their own, you could do that from your own garden probably, but sometimes it’s nice to get a little context to the shot as well. 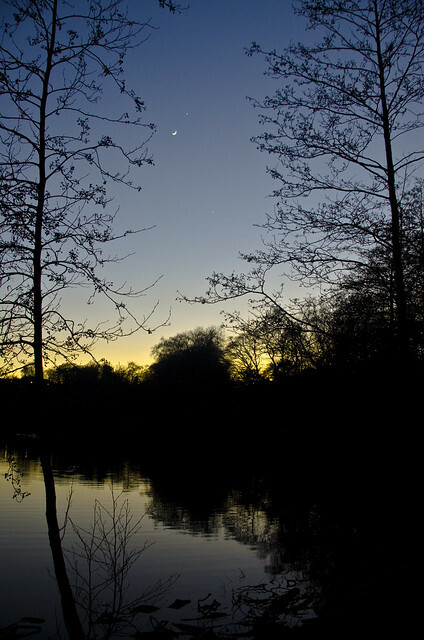 I was at Blackford Pond in Edinburgh, not long after sunset when I was taking these so a bit of playing about got the 2 planets and the moon with the tail end of the sunset over the pond. 1/8th, f5.6, ISO400, 18mm, -4/3ev. With the pond so still there were a lot of reflections from the trees but where was the moon reflection? Moving right to the edge of the pond revealed where it was and with a little playing about with the composition and waiting for a swan to move away which was causing ripples I got a respectable shot of the reflection in the pond. Same settings as the previous shot but -2/3ev and ISO3200. The super high ISO was required to get as fast a shutter as possible to freeze the movement of the gentle ripples in the water to stop the reflection distorting. This isb’t a major problem with high end DSLR’s these days but some old cameras will give very noisy shots at this high an ISO. Final shot of the night was a closer in view of the reflection, again a high ISO was required and I also switched on the VR on the lens, which you wouldn’t normally do on a tripod but it did help. After many goes, I finally got a shot with a proper moon shape and pin point stars. 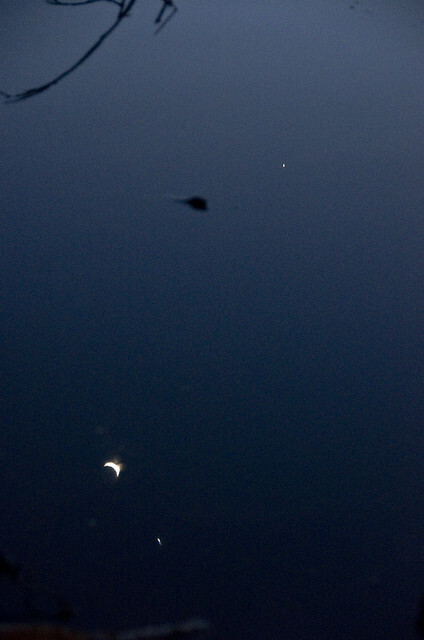 To finish up with, here’s a quick shot of the Jupiter Moon conjunction the night before, if you look very close next to Jupiter and around 4 o’ clock there is 2 tiny pin pricks of light, 2 of Jupiter’s moons. Next time you find a nice clear night and you’re looking for something new to photograph, why not see how you get on with the stars? They are far from the easiest subjects to photograph thanks to the Earth rotation but with a little practice you could be adding extra depth to night landscapes. I eased over time and now I really couldn’t give monkeys what anyone thinks when I wander past with a fully extended tripod and big camera but nobody ever really notices anyway, that’s because everyone in the civilised world now carries a camera of some sort. Just a few short years ago it wasn’t that common, now people will look at you and point in the street if you don’t have a camera in the city centre. Standing on Calton Hill for the sunset on Saturday night there must have been at least a dozen people with tripods and SLR’s and at least twice that again wandering around with compact cameras or smart phones with decent cameras. Not that unusual for Calton Hill I’ll admit that but it’s a remarkable amount of images all being captured in the half hour just before the sun goes down. Where I really noticed it was Sunday night at Newhaven Harbour. Now, Newhaven isn’t exactly tourist territory, it’s far more likely to be locals down there and again there were dozens of cameras on display of all shapes and sizes. People pulled up in cars and jumped out to get a shot of the sunset. Even up to a couple of years ago down here on a cold night you could almost be the only photographer about, now it always seems to have swarms of them! 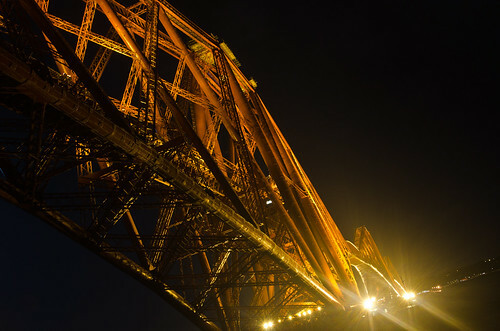 I spotted it at the Forth Bridges too recently. 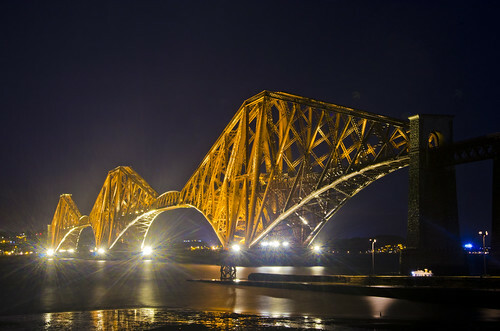 With the bridge lights back on I stopped in South Queensferry only to find at least 4 other photographers out with the same idea on a really cold night. Of course the easy availability of cameras these days if one reason behind it. Even an entry level SLR could cost you less than £300 and you could pick up a compact with your weekly shopping for under £40 easily. It’s not the whole story though, cheap cameras have always been around and it’s not just the convenience of digital either. Digital’s been about for a long time now and so have cheap digital cameras so what’s the difference? In my humble opinion, it’s the rise of social media as part of our everyday lives. We’re exposed to photographs everywhere these days, email, Facebook, Twitter, Flickr, Blipfoto etc etc etc whether it’s people just sharing images of their latest drunken night out or first attempts at photographing a sunset, the world finally has an outlet for it’s photographs beyond the paper envelope with your always disappoint prints that only your friends or family ever seen. The prints that ended up in a shoebox under the bed for years on end now have a place to live and been seen without being hidden away. From my own point of view it’s the main reason I enjoy what I do with a camera. If I were to take pictures and only ever looked at them myself yes I’d still get some enjoyment from it but it’s the easy ability to share that really makes it for me. I don’t care if an image is viewed by 20 people or 20,000. I don’t care if it’s had stacks of comments or none at all. The fact that it’s seen is enough for me. It gives a purpose to an expensive and time consuming hobby if that image is enjoyed by just one other person then the effort is worth it. Well, I knew it was going to happen. 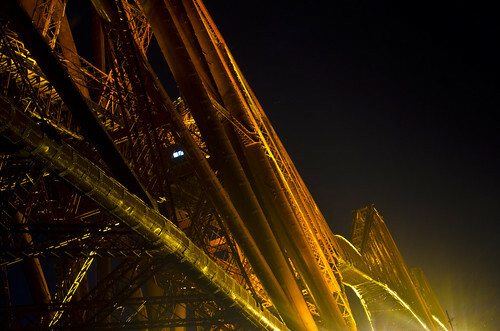 This tale kicks off back in early December when I made my first ever attempt at a star-trail image, it never happened that night as cloud rolled in but I did get a natty shot of the Forth Bridge and the Big Dipper next to it in the sky. That was the start of the near obsession with the night sky. Winter is a difficult time for me photographically, especially a winter with little or no snow like this year. Sunsets are difficult, due to working when the sun in setting and the position of the winter sunset is tricky in Edinburgh to so I typically resort to night-time shots and to be honest, I get a bit fed up with photographing the city at night so I needed something new. That something new turned out to be the oldest thing I could photograph, our universe. Since that night I’ve progressed though star-trails, photographing star fields, the Milky Way, the planets the ISS and anything else astro related I could manage with my current photography equipment but I still lacked one thing, mega zoom! I needed a telescope. So I bought one for the exorbitant fee of £30 from Jessops. Now, I didn’t expect much from a £30 Jessops junior telescope with a 50mm front on it. What I didn’t reckon for was how bad it actually was. This spindly thing was dreadful and nearly put me off a telescope all together. It was so frustrating to use. I went off the idea since then and started looking at a Sigma 150-500mm lens instead, which combined with my Sigma 2x teleconverter would have gave me a 1000mm lens, 1500mm on the crop sensor. To be honest I’d have bought this but I lacked the £800 or so I needed to get one. Then Gumtree happened. Up popped a Meade 4504 114mm Newtonian Reflector and motor-driven equatorial mount. The usual Googling was done and off I went to see it. As soon as I laid eyes on it I knew I was buying it. It was huge and that’s what matters right? £80 paid and off I went with my bazooka sized new toy. Satisfyingly filling the boot and back seat of the Mondeo it looked perfect, there was even a camera adapter with it. Glorious up close moon shots were just around the corner, or so I thought. If you’ve never used a telescope on an Equatorial mount before then you are well unprepared for how difficult it is to get the thing pointing where you want it to. Then when you discover that your 2nd hand bargain has had a harder life than you first thought the bubble slowly starts to burst. Over the next 2 days I discovered that the mount won’t lock in place, a real pain, once you located an object it requires little more than a gnats fart to move the scope and lose the object. Not that bad with the moon but a real bollock ache with the planets. No matter thinks I, it’s got a motor drive that’ll fix the problem! 10, yes 10 AA batteries later and the motor drive whirred into action. It works, yes. But wait, shouldn’t the mount actually move when I tell it to? Scratch that, it doesn’t work. So, I now have this massive malfunctioning telescope sat in my shed, the wife wont let me keep it in the living room. To be fair, it’s that heavy I don’t really want to carry it from the house to garden to use, 8ft out the shed is much better so there it lives under an old blanket. Much as I was disappointed by the mount I still figured I could at least get some moon shots with this setup. That’s when I got a stark lesson in focal lengths of telescopes. No matter what I do I cannot get the D90 to focus when attached to the telescope, either using the prime focus or eyepiece projection methods. It seems as if the camera is too far from the telescope mirror. I tried every combination but nothing worked. I’ve since read that using a 2x Barlow lens might correct the issue, I’ve got one of them so that’ll be the test for tonight. All in, it’s been a frustrating and disappointing experience so far, I didn’t expect to jump right in and be photographing details on Saturn or distant galaxies from day 1 but I had hoped at least for a sharp shot of the moon filling the frame. I’m treating this as part of the learning curve for now, I had similar issues when I first delved into proper long exposure photography but with a little dedication I did get there in the end. But, and there has to be a but. This post sounds fairly negative, it’s not been the best of experiences but there has been a massive positive. Even with the scope not perfect, I’ve managed to observe the moon really close up, right into individual craters and even a view of the moon on the lowest magnification is awesome, it’s so sharp. A truly breathtaking sight. If that wasn’t enough I’ve also observed Jupiter and close enough in to pick out the moons and the coloured bands around the planet. Something which amazed my youngest son too. I’ve also seen Saturn and the rings around the planet, a sight so awesome it’s hard to describe. When you think about the distances involved in where these objects are its mind boggling. Even if this telescope never takes a picture for the views I’ve had so far it’s been worth it alone. I’ve seen things that relative to the amount of people on the planet, few have seen. I get fairly awestruck seeing historic landmarks you’ve only heard about of seen pictures off, places like the unfinished cathedral in Barcelona, the leaning tower of Pisa, Pompeii to name a few but seeing Jupiter and Saturn? That’s quite a special feeling and one you can get from your back garden with an £80 investment.